Our bodies are so much more than just physical pieces of equipment, our bodies are receivers and senders of messages. 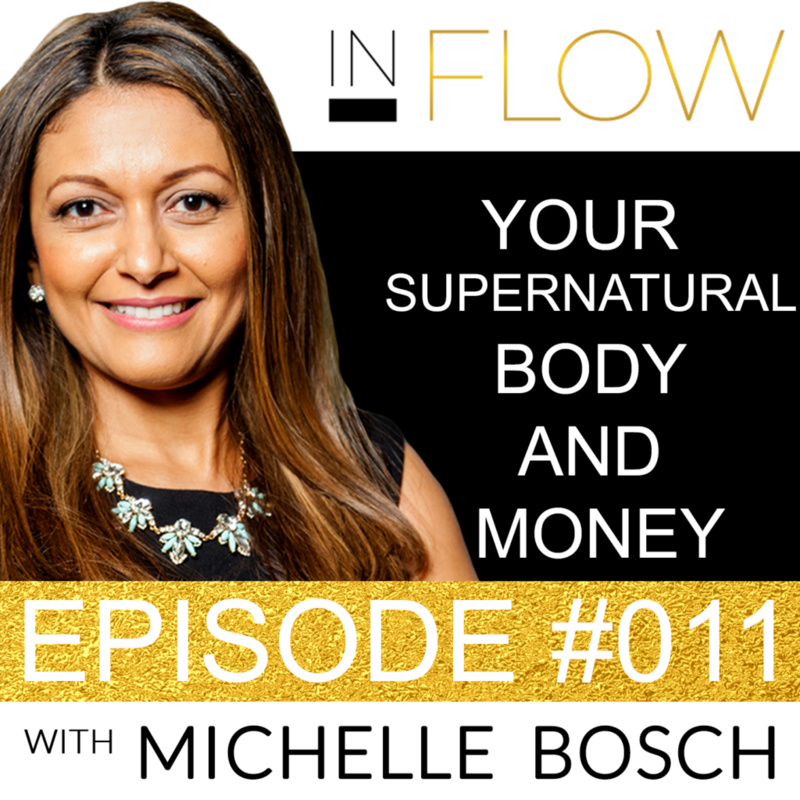 In this episode of In Flow, Michelle Bosch discusses how our bodies deal with energies on a cellular level and how this affects us on all levels. You’ll discover some truly interesting science around our nervous systems, DNA and so much more! What has this got to do with money you ask? Well, if you understand how your body works, you will understand how to ensure that you stay radiant, energetic and inspired – meaning you can be your most productive and creative self! 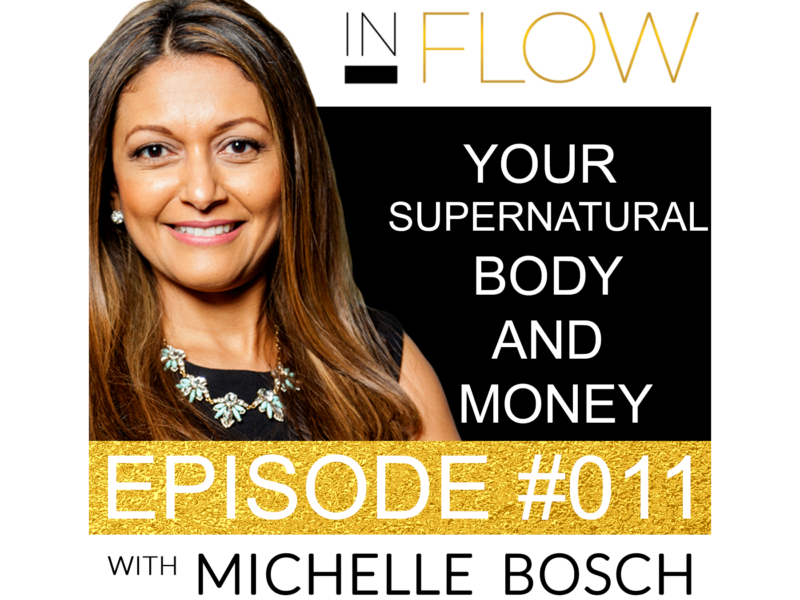 Listen to this episode of In Flow with Michelle Bosch to discover how to energize and inspire yourself by simply changing your view towards gratitude. When I am taking care of me, I am taking care of US (as in the world around me because of the power of transmission) and that is incredibly meaningful to me. I don’t feel selfish for taking the time to stop everything and take care of me. Welcome to the Inflow Podcast…I am your host Michelle Bosch…I’m very happy to be sharing some time together with you again today! And I usually don’t like to start a conversation by asking for something…but I really need your help. See my goal with this podcast is to reach as many women and enlightened men as I can and share what I have learned about wealth, money, real estate, business building, health, vitality, spirituality and faith…so that many more women can live prosperous lives following their passion. An in order for me to reach more people… if you like the episodes that you have listened thus far or if this is your first episode and you enjoy it please do me a favor and leave me a “written review” which is very important. It doesn’t have to be long…it can be a one liner with your impression of the show. I know we all have busy lives…but it would mean the world to me if you took an extra minute to not just give the InFLOW show a 5 star review which I greatly appreciate but also do a written review because this is the biggest factor that would help me get a higher ranking on Itunes and build momentum to get on their new and noteworthy rankings. So now moving on to the topic of this particular episode…let’s jump right in…well All I have been interested in for a while now is the spiritual dimension of life and what I have found is that inner vitality is the foundation of our success on the outside …and based on this premise I would like to talk to you in today’s episode about our human Body and what I know for sure our bodies are and what they are not based on my personal experience. I am sharing my view on our bodies because we all are learning lessons for one another…so I hope this episode gives you more a different perspective of your body than you probably have right now based on the lessons I have learned. So let me start by sharing that I believe that there is a hidden purpose hidden in our DNA and that higher purpose is to be radiant for no other reason than being alive… which in turn unleashes your uniqueness, service and devotion to others and gives others permission to also bask in the glory of their radiance and in turn be of service and become part of the whole. So basically what I am saying is that your body and more specifically your DNA carries intent from a higher realm that is far beyond you as an individual person and body. So having said that…What I know for sure is that my body and your Body-is not just a bunch of bones, muscle and skin walking around with a logical brain mass acting as the control center for the body…and I am sure any woman that is a mother will tell you that if it would have been up to our logical and conscious brain abilities also called the somatic nervous system to create a baby…we may have not gotten it quite right. I know that in my case in spite of being so incredible detail-oriented….my daughter Sophia may have been missing a vein or critical gland if just my somatic nervous system would have been involved in her development of a full term baby. And just to explain your somatic nervous system isThe part of the nervous system that controls voluntary movements in the body, such as those performed by the skeletal muscles. So our bodies are much more than just this physical piece of equipment or organism…. and I like to think of the body based on my time and experience inhabiting mine… as both a receiver and transmitter of information much like a radio…meaning your body is both a receiver and a messenger. We all are sensitive humans whether you think of yourself as a sensitive person or not. Because when refer about Sensitivity I am not referring to you wilting like a flower when someone is having a bad day and is a jerk to you….what I mean by sensitivity is that our bodies have centers of awareness beyond our logical mind and brains…these centers of awareness are not just located in our head but in other areas of our bodies. and this episode is by no means about cellular biology but what I would like for you to understand and if you don’t remember anything else please know that the parts of the cell I just described are listening and responding to their environment. They have antennae in their membrane that act as little switches that receive and interpret the stimulus or signals from the outer environment and these in turn relay this information to the DNA within the nucleus of your cells. And this process of receiving and transmitting information is constantly happening whether you are aware of it or not…and this is the case thanks to another part of your body called the autonomic nervous system. The autonomic nervous system…in case you don’t know is the part of the nervous system responsible for control of the bodily functions not consciously directed, such as breathing, the heartbeat, and digestive processes. Another thing that I want to mention and then I promise I will try to stay away from the science lesson…I am by no means a scientist… my background and education are in Finance but I am a big fact finder by nature and in my quest for vitality I have done a lot of research to figure out how to optimize this amazing piece of equipment and vessel called our body….so having said that what I want to also share is that DNA is a natural conductor of electricity and very sensitive to electromagnetic waves..which means that the tiniest shift in your mood or emotions creates a signal… or trigger your DNA to respond. Emotions are created by thoughts and in my experience negative or positive thoughts create an electromagnetic current that make your DNA respond biologically in different ways. So what this boils down to is that most of us walk this earth completely oblivious to the fact that thoughts, emotions, beliefs, people that you associate with are co-creating the cells of your body. So if you’ve heard before that you are the average of the 5 people you hang out with this is proof of how accurate that statement is and how discerning you have to be in moulding and creating an environment in your internal world as well as in your external world…at your home and business that affects your attitude and outlook towards the world positively. 3) or give a different meaning to an experience that in the moment seems bad …for example recently I broke a toe a week after recovering from a bad flu and a lung infection and instead of feeling sorry for myself I reframed the experience to mean to me that I am redesigning how I stand in the world as I grow new bone cells… and it made a tremendous difference in my perception of pain …and healing has occurred relatively fast…I’m not going to lie though I needed ibuprofen to be able to go to bed the night it happened…so for all of us it is a process of catching ourselves in the negative state and becoming aware of how we are affecting our body with our attitude. BTW the process of programming your DNA through your attitude to life is at the core of a new branch of study in the area of genetics that is known as epigenetics which is demonstrating that you are not a victim of your DNA and are only a victim of your attitude. So that means everything you think, feel, say, and do programs your genes and therefore your reality. So very few people understand this secret and the freedom that it entails. Now if we take this further what this also means and I have alluded to this already when I said that we need to be discerning in terms of who we hang out with…is that the electromagnetic field of our body when we are communicating with others not only affects us but it affects whoever you are communicating with…..this is an incredible distinction to make because now all of a sudden my transmission meaning my communication with you through this podcast – is changing you and therefore changing your reality on just the sheer power of transmission based on the information I just shared about my research, my findings, and my experience. So for all my ladies…. because I know we all sometimes struggle with speaking up… I want you to know that when you think you have nothing to add or to say in a meeting or any situation for that matter…I would like for you to please do me a favor and own your presence and your worth…your voice is a powerful creator of your and other people’s reality…especially if what you are saying is aligned with your heart and your mind. You are changing those around you by the sheer power of transmission of your voice and your presence. Another distinction I would like to share about our bodies based on my experiences… is the fact that Our past becomes our biology. Why you may ask? Well the reason why…. is that experiences affect the neuro circuitry of your brain as well as the chemistry of your body which then produces certain emotions or feelings. For example, my experience as an entrepreneur with obligations, payroll, projects, a team, negotiations, metrics to hit… and everything that comes with being your own boss can cause monumental stress episodes of fight or flight. And this stress in turn affects our Autonomic Nervous System or Involuntary part of the Central Nervous system…. and the stress episodes which…. if your are a business are a daily occurrence…. freeze into a pattern in the neural and chemical architecture of our body…meaning it leaves in imprint…and our nervous system creates a memory and how we think and feel can become stuck. In order to become unstuck as I described a little bit ago I use my body, change my language or reframe an experience…since this episode is about this magnificent miracle of our body let me continue sharing some of the very actionable strategies I use. I think I briefly mentioned I use dance…I’ll turn on the music and dance either with eyes opened or eyes closed and just let the body be inspired to move based on the music…in order to do this I highly recommend you have enough space and it may feel odd in the beginning and you might think this is crazy but I guarantee you 100% the state of your nervous system will change with just 5 minutes…I will also bounce…I have a mini trampoline in our bedroom and we use to have another one in our office (but I mostly work from home now)…I will also do breathwork and that just means inhaling and exhaling in specific rhythms that also calm the nervous system…or I’ll sit for a 10-15 min meditation of body awareness, breath, or positive states where I send gratitude, compassion, and love towards myself, my family, and my community. Sometimes I’ll be so trapped by a stress state that I can’t meditate and my mind is just going crazy chasing purple squirrels ( that’s my code word for problems in the past or future that do not exist)….so I will need to super impose a different state and I’ll simply listen to someone with a positive attitude and message…I love for example listening to Joel or Victoria Osteen or I’ll engage in prayer and I will speak to God and with God’s help recreate a more joyous state and therefore create a new body reality and outer reality. One last thing that I want to share and it is NOT by any means revolutionary is that for the last several years….I first start my high producing days doing something I love…it could be yoga, exercise, reading, listening to uplifting messages, meditation, writing in my gratitude journal. I know longer jump into production and generating results…that approach only expands my left brain but also my stress levels instead of unleashing clarity and creativity. I also now actually have scheduled PLAY days…where I don’t think about any production of results or engage in any activity that involves my business and these are the days that allow for production days to be incredibly powerful. I can create initiatives that generate 6 and 7 figures easily because my body is rested and radiant and basking in states of joy that help me have clarity and experience high frequencies of creativity, confidence, and divine downloads of ideas and insight. Yep… I call ideas and insight “Divine downloads” and just in case you haven’t made the connection..these divine downloads also change your genetic expression, your body, your heart and mind. This means of course that as you change your body at a cellular level with divine downloads and states of gratitude and joy ….your present is becoming your future and success in all areas of life is inevitable….you can’t stop it…. and all thanks to your supernatural body. So just to wrap things up I shared some super simple strategies that help you to kind of cleanse the palate of your nervous system so that you can spend more time in positive states that affect your nervous system and change you at a cellular level because your cells are always listening and responding and creating happy hormones or stress hormones in your body. There is a direct connection between peaceful and joyful states neurologically and chemically in the body and being able to access these daily results based on my experience in a kind of spiritual alchemy or magical transformation of my reality not just in my health or vitality but also in our finances. So next time you feel guilty, or can justify taking time off to do things you love and take care of your body say this to yourself : When I am taking care of me, I am taking care of US (as in the world around me because of the power of transmission) and that is incredibly meaningful to me. I don’t feel selfish for taking the time to stop everything and take care of me. So I think that is all I have for now on our bodies creating Spiritual alchemy and magical transformation of our reality. Enjoy and love your supernatural body.